The Laotian community in Contra Costa County, CA lives in one of the most toxic regions in the nation. Surrounded by more then 350 industrial sites and toxic hazards, their home, school, and work environments are exposed to dangerous levels of lead, pesticides, and other chemicals on a daily basis. As refugees who entered the U.S. in the 1970's, the Laotian community is still a relatively new population with little voice about the policies affecting their lives. LOP was started in 1995 to bring together the diverse Laotian ethnic and tribal groups in Contra Costa County to respond to the needs of the community, work toward change, and provide a vehicle to build the community they envision. LOP has a membership base of 200 families and over 20 leaders. At a general membership meeting in February, nearly 90 LOP members discussed our work and plan for 2008. The meeting kicked off the development of a long-term community-based Environmental Justice agenda for Richmond which will be completed this summer. To deepen everyone’s knowledge of Richmond, staff acted out the dominant corporate, environmental and political agendas of Richmond. We laughed and booed while learning the local landscape. At the end of the skit, LOP members discussed their own solutions to the economic and political problems facing Richmond and their vision for a more environmentally just city. We are all looking forward to working with you and our members to develop the agenda which will guide our issue and policy campaigns for the next 5 years. Stay tuned & be ready to cheer us on in the summer. If you are an ally organization and would like to use our skits of Oakland and Richmond political landscape for your membership, please email Mari Rose. Everyone has a basic right to continue to live in their communities. LOP’s newest front of environmental justice is fighting displacement and winning protections for tenants against unfair evictions. LOP’s focus on housing justice strongly affirms what environmental justice is all about: fighting for basic rights to protect our communities where we live, work and play. For nearly 20 years, the Laotian refugee community has struggled to rebuild and grow roots in the Richmond/San Pablo community. When families leave the area because of unfair evictions or high rents, they not only face a tough rental market, but also potential isolation and disconnection from family, culture, and community. In the Just Cause Campaign for tenants' rights and protections, LOP leaders and members work together with Richmond Vision 2000 a coalition of faith-based, labor, and community groups to advance a progressive environmental and social justice agenda. 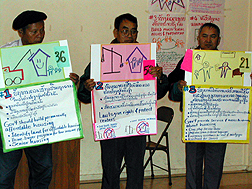 Fighting Fire with Fire highlights the Laotian Organizing Project's first community victory for a multi-lingual warning system.